I've created the first patron-only post on my Patreon site! I don't have much on Patreon (yet), but I wanted to put something out there to give an idea about the things I'm working on. This first post is digital art, a small image titled Gear Girl. It's done on the computer by editing the base image (a woman's face), then modifying that image using another image (a bunch of gears), and finishing with a little touch-up editing. These are not too difficult, but can still create interesting artwork. It wouldn't be fair to those who might become a patron to put the entire image out here, but I will give you a little teaser! Eventually, I will be putting more digital art on Patreon, but I will also be scanning in traditionally produced art and, of course, my writings. I was thinking a serialized story might work. If you have any thoughts on this, please let me know! P.S. It would be great if you could check out Terri Deno's Patreon site and, perhaps, consider supporting her writing efforts! Struggling authors need all the help they can get! It's getting close to Christmas which means all those traditional Christmas stories are starting to make the rounds. My favorite is A Christmas Carol by Charles Dickens. I try to see a version of it every year. This year was special. 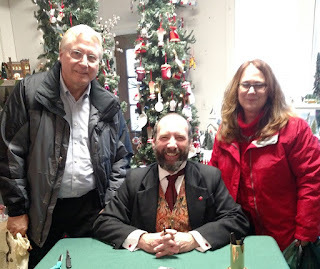 Marie (my better half) and I were fortunate enough to get tickets to see Gerald Charles Dickens, the great-great grandson of Charles Dickens, perform the story live. The one-man-show took place in the old Ebenezer Baptist Church in the little town of Occoquan, Virginia (not the current EBC facility in Woodbridge, Virginia). 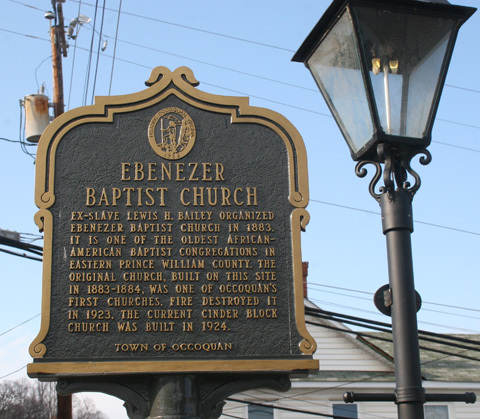 Historic marker for Ebenezer Baptist Church, Occoquan, VA. The church is not large, but Gerald does two shows the same day to accommodate as many people as possible. The shows are sold out months ahead of time. Afterwards, many walk up the street to The Golden Goose where autographs and pictures may be had (for free). The Golden Goose is a Christmas shop with every sort of decoration imaginable on display. 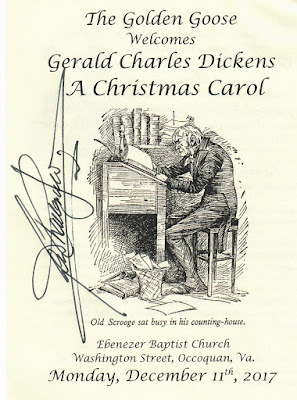 I had a small copy of A Christmas Carol and the flyer for the play which Gerald signed. Marie had an illustrated version of the story and a flyer to be signed. And we took several pictures, of course. While no pictures or other recordings are allowed during the show, he more than makes up for it afterward! 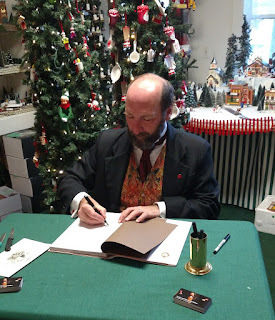 He was very accommodating and never rushed anyone, often signing multiple copies of books and allowing many pictures by each person or group to be taken during the autograph session. We thought the show was great and are hoping to attend again next year. We must remind ourselves to mark the calendar, however, as the tickets sell out so quickly! Please note that Gerald does shows around the country (and also in England) so you don't have to be in Virginia to see him. If you enjoy the story and happen to be near where one Gerald's performances take place, consider seeing it for yourself. I think you'll find it enjoyable! In addition to his web sites, you can find Gerald Charles Dickens on Twitter at @DickensShows. Yes, the title of this blog post is so bad, and yet so true. I noticed the other day I have stories in three anthologies with the word TALES in the title. Coincidence? Perhaps. It wouldn't seem so odd if I had stories in fifty or a hundred anthologies, but I only have entries in eleven published collections. Must be a statistical anomaly. 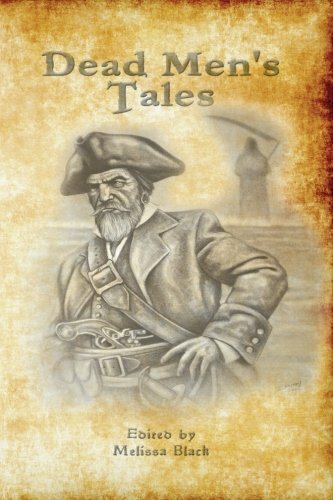 The latest is Tales by the Tree from BHC Press. If you're looking for an entertaining bunch of short stories for the holidays, this is the book! My story is The Last Snowfall. It's about a young girl trying to deliver a special Christmas gift for her mother—only she hasn't much time! BHC Press was good enough to Tweet a link to an excerpt from my story, The Last Snowfall, published in the holiday-themed anthology Tales by the Tree! Thanks! 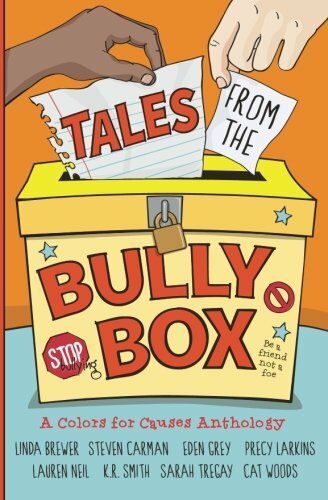 The final anthology is called Tales from the Bully Box published by Elephant Bookshelf Press. My story, One Above Zero, is about a girl who is the target of a bunch of bullies until one of the bullies sees the real problem. It's a good book for middle grade children. That's all the tales I have for the moment. But check back from time to time—you never know when I might grow another tale!